In Greek, the word for peace is eirene. It means calmness and tranquility of mind and heart. Are you calm and tranquil? The "Tip Clip" is simply a clothespin used to jog your memory. 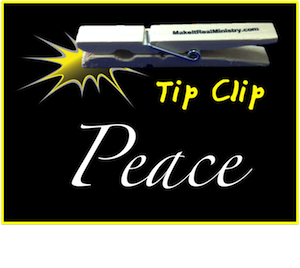 Place your "Tip Clip" in a spot that will give you daily reminders to work on the Holy Spirit characteristic of Peace. (Examples: Carry it in your pocket, attach it to the computer monitor, or hook it to your favorite coffee mug.) Use the tips below to help you grow in this area. Tip: Plan a time every day to sit and be totally quiet for 10 minutes. Focus your mind on nothing other than holiness. Meditate (Psalms 77:12). Ask God to center your thoughts on Him and to give you power to find peace in the midst of worldly chaos. Back to Top of "Peace: Characteristic of the Holy Spirit"